Managing your finances doesn’t have to be difficult. With Banktivity, you can track expenses, know when to pay upcoming bills, gain valuable insights into the performance of your investments, and a whole lot more. Best of all, everything you need for financial peace-of-mind is available on your Mac and iOS devices. Banktivity empowers its users to manage all of their financial accounts in one place, includes real-time budgeting, and syncs with the free iPhone version of the app, so your finances are always right at your fingertips. 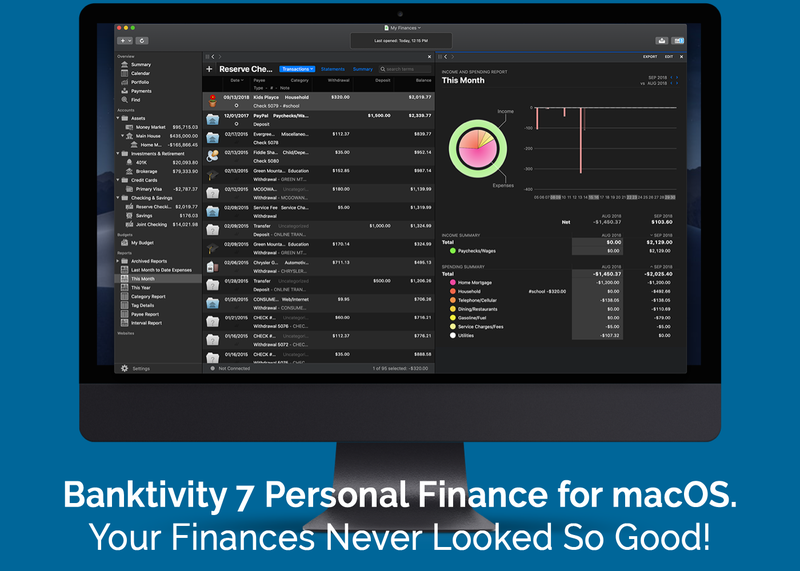 With version 7 of the Mac app, Banktivity’s functionality adds all-new ways to track and analyze your finances. Banktivity for the Mac has added a stunning new dark mode that looks great alongside other macOS Mojave apps. IGG Software, the makers of Banktivity, painstakingly examined and redesigned every corner of the app to take full advantage of dark mode. The app also has a new ‘Calendar View’ that ensures you’ll never miss a bill again by letting you see past and upcoming bills and transactions. You can even customize which accounts are displayed and track their running balance over time. Direct Access, which can be purchased separately, is faster than ever. Now, you can connect to over 14,000 banks and import your financial transactions quickly and seamlessly whether you’re on your Mac, iPhone, or iPad. There’s an all-new real estate account type too, so you can track property you own and link it to related loans and mortgages. If you’re in the US, you can automatically follow your property’s estimated value with Zillow, and there’s a new view with details like your home’s available equity. Say goodbye to financial stress and hello to Banktivity. Visit IGG Software’s website to learn more about Banktivity today. There’s a free 30-day trial available, so there’s nothing to lose. And when you’re ready to purchase, use the discount code MACSTORIES10 at checkout for 10% off. Our thanks to Banktivity for sponsoring MacStories this week.